Jeff Gordon shows off daughter Ella Sophia prior to the start of the NASCAR Sprint Cup, Samsung 500 race at Texas Motor Speedway in Fort Worth, Texas yesterday. 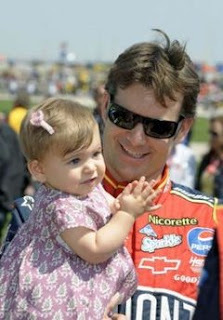 I am sure that Jeff was hoping that Ella would bring him good luck during the race. Sadly, the one time champion struggled on the track and finished dead last after spinning out and crashing his car. Don’t worry Ella, it’s not your fault. Your dad has never won in Texas. ella looks so cute!she has grown up so much!